A proposal to invite Pope Francis to include Galway on his proposed visit to Ireland in 2018 is set for discussion at the November sitting of Galway City Council. Cllr Pearce Flannery who submitted the motion says “it is a win-win for everybody concerned, religious and secular alike”, and has asked all councillors and stakeholders to support this proposal and get behind the initiative so the invitation will have unanimous support once it is issued. 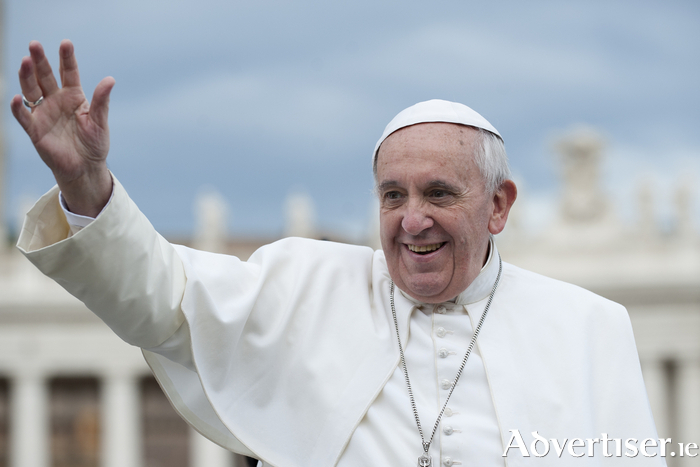 If Pope Francis comes to Ireland in 2018, he will be the first pontiff to visit these shores since 1979. On that occasion Pope John Paul II visited Galway on September 30 1979 and celebrated Mass at Ballybrit race course where an estimated 280,000 people attended the now famous Youth Mass. Speaking exclusively to the Galway Advertiser Cllr Flannery said; “It is likely that the Pope will come to Ireland in 2018, and if that comes to fruition, I think it is important that Galway is firmly on the agenda. The process needs to be kick started somewhere and I think as a councillor it is a good idea to issue an invitation. Cllr Flannery hoped that a decision on the motion would be reached promptly because of the amount of preparation and detail involved in such an undertaking. “It is imperative that we get Galway on the itinerary as soon as possible because decisions and plans must be made from a wide range of quarters, not just in Ireland. Issues such as security, logistics, accommodation, all of these things must be taken into account with an event as significant as this and a lot of these decisions will be made in advance long term, perhaps 18 months. The Fine Gael councillor added that a papal visit would be another feather in the cap of Galway’s ability to host major events. “At a secular level it will attract a huge amount of people to Galway. In the short term it will give a huge boost to tourism to the city and wider area. It will again bring Galway under world scrutiny in a good light. Apart from the potential commercial benefit, the Galway councillor was keen to stress how important the visit would be spiritually for Catholics in Galway and the west. “From a spiritual viewpoint, we still are a predominantly Roman Catholic country, and for the leader of the Roman Catholic church to come to this country, it is important for all people living on the west coast that we get to see the Pope here. It is critical that we are not forgotten. I want to make sure that does not happen with this proposal.